If you find yourself in a lot of high-speed chases, spike strips are probably the bane of your existence. New airless tires from Bridgestone could soon eliminate flat tires from spike strips and all kinds of other things – because there’s no air inside them to escape. 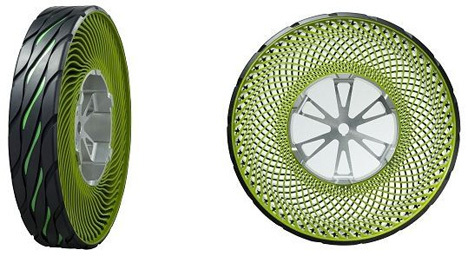 The innovative tire design features recyclable thermoplastic resin spokes radiating out in lovely patterns from the rim to the tread. Pity about the puke green color, though. 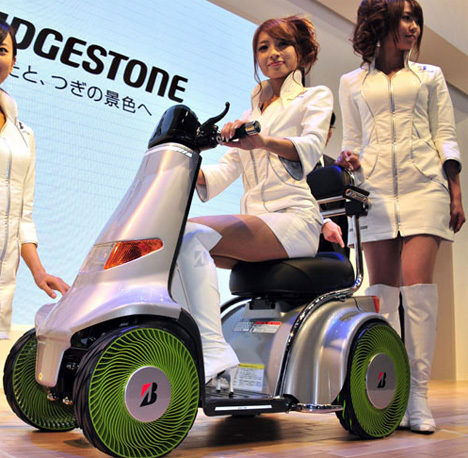 The tires are being displayed at the Tokyo Motor Show 2011. If the new type of tire ever becomes standard, we can look forward to reduced maintenance costs and longer lives for our tires. The shock absorption properties will be comparable to current tires, but no one will ever have to worry about changing a flat tire on the side of a busy freeway again. Plus, since the entire assembly is made of recyclable materials, you would simply be able to put them out with the rest of your recycling when the treads become too worn to drive on. Models in go-go boots not included.